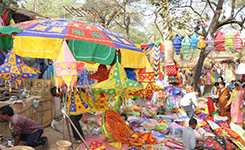 The fair is held on 1st Ashad (June-July) for 3 days in village Bhunter. The fair is seasonal and religious. The fair was started by the Devta of the ilaqua Suraj Pal. Palaghmiar a Devta from mardo also attends. From this day the use of food grains from the newly harvested crops starts after cooked food offerings are made to the gods and then the meal is shared by other relatives and friends. This is known as ‘Tahoolikhana‘ in the local terminology. Dussehra is celebrated in most parts of the country on Vijya Dashmi to commemorate the victory of Rama over demon king Ravana. The highlight of this fair is The victory of good over evil. 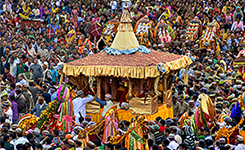 Kullu Dussehra is however, different in certain ways from Dussehra celebrations in the other parts of the country. It presents cultural ethos of the people and their deep rooted religious beliefs which manifest during this festival with traditional songs, dances and colorful dress. It begins on Vijya Dashmi and lasts for a week. There is an interesting behind the beginning of Dussehra Festival. 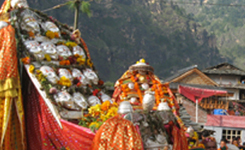 And now also, the internationally famous Dussehra of Kullu is celebrated in the same tradition. This fair is held on 1st Baisakh (April 13) for one day in village Khokhan. The fair is religious and seasonal. The legend connected with he moved by the alluring beauties of the hill springs used to dance at this place with her girl friends who were daughters of Rishis and Munis. The local inhabitants also regard themselves as the progeny of the daughters of those Rishis and Munis. The goddess is worshiped outside and then it is taken inside the temple. The people offer young yellow sheets of barley which are specially sown for the occasion to be offered to the Devi along with garlands. Then a he goat is scarified. Thereafter the women sing and dance around the Rahta carrying the Devi. The devi is also danced about. Men-fold stay on as spectators and on-lookers.